Baton Rouge police officers showed racial bias, conducted illegal searches and employed excessive force, said some New Mexico state troopers who left Louisiana after only two days of working alongside the Baton Rouge cops. Reports filed by the New Mexico officers have now been published in a local newspaper, The Advocate. The documents from an internal investigation by the Baton Rouge Police Department have become public just now, after a lawsuit initiated by The Advocate in July 2006 was successfully argued before the Louisiana state Supreme Court last year. The newspaper has put a document online that includes a letter sent by New Mexico State Police Maj. Daniel Lopez on Sept. 13, 2005 to the Baton Rouge police department plus personal reports that Lopez directed New Mexico state troopers to write describing what they witnessed on patrol with Baton Rouge police those two days in September 2005. 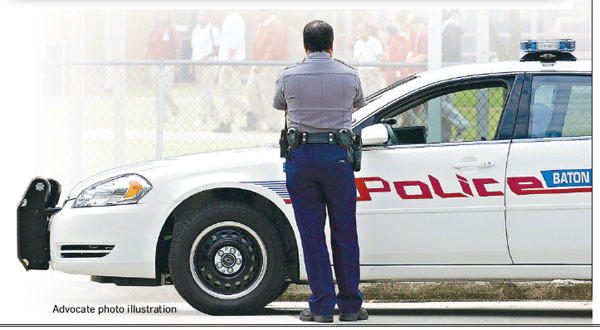 The state troopers from New Mexico and Michigan were pulled out of Baton Rouge two days after arriving to help the local police in September 2005. Baton Rouge police officers “commented or implied” to New Mexico troopers that they had been directed to make things “as rough as possible” for the people who had arrived from New Orleans in order to discourage them from staying in Baton Rouge, according to the letter by Lopez. “‘As long as they want us to harrass these people and run them out of town, I will gladly do it,”‘ Hall quoted a Baton Rouge police officer later in his report. The complaints of Hall and Lucero are two among many in the document posted by The Advocate. In his letter to Baton Rouge police, Major Lopez said he pulled New Mexico’s state troopers from the assignment after debriefing them on the second day. In an article in The Advocate about police actions in Baton Rouge following Hurricane Katrina, described in the documents, Baton Rouge police officers both refute and acknowledge the allegations. “Asked why law enforcement officers from other states would lie about what they saw Baton Rouge police doing, LeDuff said he suspects the troopers wanted to be where the action was. “’I was not going to let Baton Rouge be overrun by some people from New Orleans who were hell-bent on committing crimes,’ he said in an interview last week. In January 2006, after an internal investigation, one officer was suspended without pay for three days, one was reprimanded and three others were sent to counseling by supervisors. One officer cleared of excessive force claims was fired later for a similar 2008 incident, The Advocate reported. This entry was posted in Human Relationships, Human Rights Civil Liberties, Land Grab, Social Justice and tagged baton rouge brutality, katrina brutality, katrina racism, new orleans evacuees, racism. Bookmark the permalink.